Last year one clueless bloke with a dream, another with skill and a stranger with chocolate all decided to lock ourselves in a few meters of space and expansive waters of peril, R2AK 2017. Here is what we learned. Get a peddle system. We have considered returning for another go at R2AK , retrieving our boat and our egos at large. We would only consider this if we installed a peddle system this go round. After building, breaking, rebuilding and attempting to propel with a couple rowing stations, we have the bruising to show the error of our ways. This means of propulsion was far less effective than it was painful. Paddle boats > row boats. Trust us (this is rarely a good idea, but in this instance, you can trust that we could have done better). Have patience and forethought. It’s like past is now. The worst weather day of R2AK 2017 was certainly scheduled for the training grounds. Very tricky Olympia, we see you. Those of us set upon adventure are easily caught up in the bang of the starting gun, the rush to your boat. Freddy got so lost in the moment, he wasn’t quite sure where his boat even was, but kept on running. Then we paddled for ages, waiting on wind. Then, as if everyone had wished too hard, the wind came, and with a vengeance. We’d all seen the warnings, but only a few did it right. 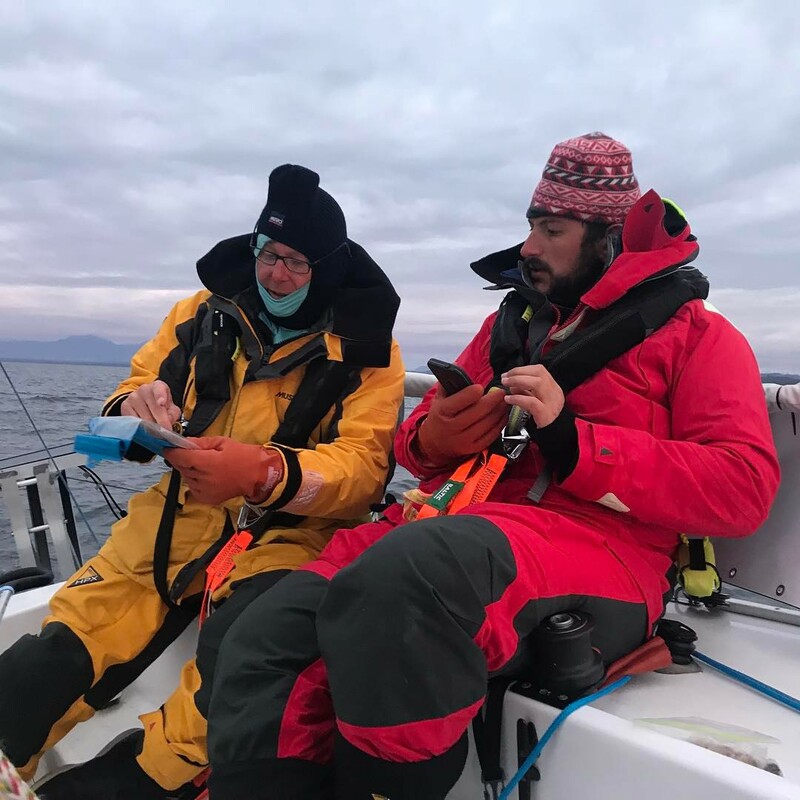 While most of us rowed ourselves into the middle of the rage, a few intelligent teams, sipped coffee, had a croissant, slept in a comfortable bed and set sail the next morning. This is about the time we finally made it after about 24 hours of panic. Those who waited sailed quick and easy the following day, while others tapped out the day before. Check your rudder! This one may be oddly specific, but hey, they’re our mistakes, so listen up. All the bobbing and bouncing takes a toll on your little boat. I suppose it’s worth assessing all your rigging prior to setting sail. We had an angel appear just before sneaking out in the middle of the night to pass through the Seymour Narrows. If you are cruising R2AK, we assume you are aware of these narrows. If you are not, well, good luck. The angel to our devil showed up on the dock as we were setting our boat free to point out that our rudder had come unattached. Whoever you are, shadow man on the dock, we applaud you. Even more, we owe you a free burrito for saving us from entering the narrows sans steerage. Accept the help of strangers. This mystery man was not our only personal crutch. There were many who carried us along the way. We bought the boat from someone who had raced R2AK the year before. His wife prepared copious amounts of food for our trip. We borrowed a tiller extension from a stranger. We were invited into port for rest and food. We paid it back a little helping another racer dock without electronics, but mostly we took, and we don’t feel badly about this at all. They talk about the spirit of R2AK is not to be taken lightly. Not only are the other racers an amazing resource, but the past racers, the locals and the fans are all there to cheer you, help you, feed you. As long as you didn’t plan on help, you are completely encouraged by us to accept it as it comes your way. Don’t eat three course meals. We may have treated ourselves better than we deserve. This is very, very likely. We don’t earn much beyond ridicule. Despite the amazing job Fran did prepping meals for us, we managed to explore our gluttony and eat our way through our provisions well before reaching Ketchikan. Basically, ration your rations. Make a plan, then change it. Sure you should think that you know what you are doing. We went in with brilliant plans of attack, then the attack came upon us and we had to change. Our electronics didn’t charge in the foul weather and after setting out from Bella Bella, we were forced to turn around after our lights all went dim. We headed out to open water for speed after eating through all our stew and beans. We ditched Sandy on a moving water taxi instead of eating him alive to make to final leg of the trip. R2AK will take you on the journey. Accept it’s plan and follow it. Fair winds and following seas to all of you mad adventurers.